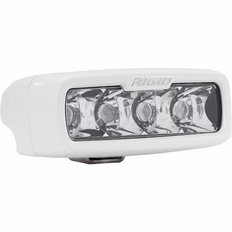 Rigid Industries� Marine Series LED Lights are corrosion resistant, even in salt water, and are assembled using Marine-Grade materials. Each LED light receives a chromate conversion coating that acts as a corrosion inhibitor against the elements and finished with a high quality, UV-resistant powder coat finish to provide years of durable, reliable operation. At 5" Wide, 1 13/16" Tall and 2 1/4" Deep, these LED Lights pack a serious punch for their size! 3168 raw Lumens, 32 watts and only a 2.29 amp draw to be exact. 's patented Hybrid optical system continues to lead the field in efficiency and projection. This patent is one of my reasons that the competition simply doesn't stand up to the quality and performance of SR-Q Series LED Lights. By using the latest Cree and Osram LEDs, USA Made SR-Q Series LED Lights project more than twice the amount of light at the same power. Top it off with the fact that LED Lights come with a lifetime warranty and the choice is clear.